Give her the best diamonds have to offer! Crafted in your choice of polished 18K white or yellow gold, this band features two rows containing a total of 22 princess cut diamonds in channel settings. 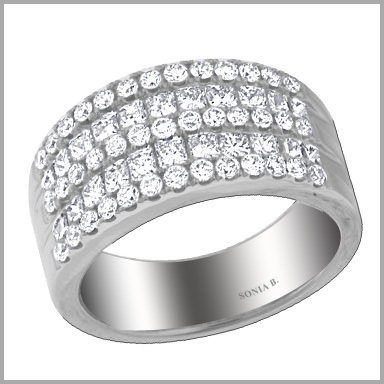 It also features 33 round cut diamonds in bead settings. The total diamond weight is approximately 1.7600ct with a color of G-H and clarity of SI. The setting size is 3/4" x 1" with a height of 1/8".